On September 18, 2015, about 1700 Alaska daylight time, a Robinson R-44 Astro helicopter, N7162R, sustained substantial damage following a separation of the tail rotor gearbox while hovering in a remote bay on Umnak Island, about 24 miles southwest of Fort Glenn, Alaska. The commercial pilot, the sole occupant, sustained no injury. The helicopter was registered to 62 Romeo, LLC, Van Nuys, California, and was operated by Bering Pacific Ranches, Ltd., Calgary, Alberta, Canada, as a Title 14 Code of Federal Regulations (CFR) Part 91 visual flight rules aerial mustering flight. Visual meteorological conditions existed near the accident site at the time of the accident, and no flight plan was filed for the local flight. The flight originated from the operator's base of operations at Fort Glenn at 1500. In the National Transportation Safety Board (NTSB) Accident/Incident Reporting Form 6120.1, the pilot reported that after departing from Fort Glenn and traveling about 30 miles, he arrived at Russian Bay. 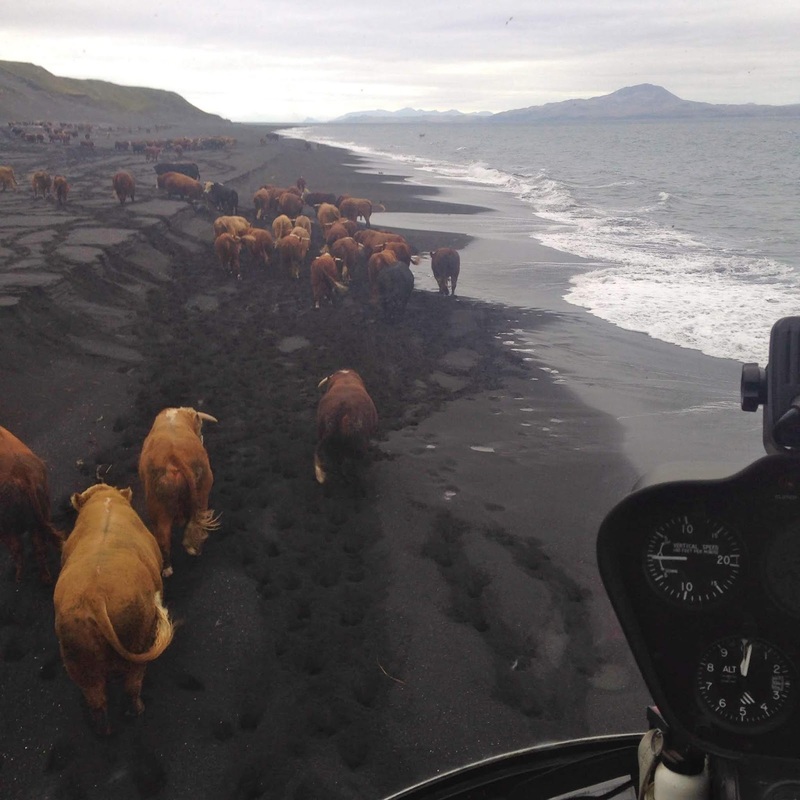 The aerial mustering flight involved cattle located in a flat valley of marsh and sandbars. While in a hover between 10 to 15 feet above ground level behind a ground of cattle over a flat gravel sandbar, he heard "metallic grinding noises" from behind his position in the front right seat of the cockpit. The pilot reported the helicopter was "stable with engine power," the rotor rpm was within normal limitations, and he had "normal responding controls and tail rotor authority." The pilot immediately landed the helicopter on the sandbar, completed the shutdown process, and exited from the helicopter without further incident. While conducting a postflight inspection, the pilot observed that the tail rotor gearbox had separated from the tailboom attachment point and was laying on the ground. After securing the helicopter, a second company helicopter from the operator retrieved the pilot and returned him to Fort Glenn. The helicopter sustained substantial damage to the tailboom and tail rotor system. Additionally, one of the main rotor blades sustained substantial damage. Photographs of the helicopter post accident showed the tailboom attached to the fuselage, and the vertical stabilizer attached to the tailboom with the tail rotor system guard and the tail rotor skid intact. The helicopter was subsequently recovered, although the tips of the two tail rotor blades were not recovered. The tailboom, the tailboom mounting flanges, the tail rotor gearbox, and the two tail rotor blades were shipped to the NTSB Materials Laboratory in Washington, District of Columbia for examination. A review of the airframe maintenance records revealed that an annual inspection was conducted on July 21, 2015 at 2,490.5 hours (helicopter total time). No preexisting malfunctions or failures with the tail boom, the tail rotor drive shaft, the tail rotor gearbox, and the tail rotor blades were noted in the airframe maintenance records. The helicopter was not equipped with an emergency locator transmitter (ELT) for remote operations in Alaska, nor was it required to be. Additionally, the helicopter was not equipped with a skid-based emergency floatation system for overwater operations, nor was it required to be. Operator: Bering Pacific Ranches, Ltd. The tailboom, the tailboom mounting flanges, the tail rotor gearbox, and the two tail rotor blades were examined by a NTSB materials engineer and the NTSB investigator-in-charge (IIC) on June 13, 2017 at the NTSB Materials Laboratory. The tail rotor gearbox was submitted with 3 of the 4 mounting flanges separated – both top flanges and the bottom flange on the port (left) side. The separated top flanges were submitted separately with the mating bolts still assembled. The bolt from the separated bottom flange was also submitted, but the flange was not recovered. The helicopter tail boom was also submitted, with the other ends of the top and bottom bolts from the port (left) side still assembled. All of the bolts were still assembled inside the flanges and the tail boom had fracture surfaces that were in-line with the plane where the two components mated. All of the bolt pieces, both still assembled and submitted loose, had corrosion on the fracture surfaces. The bolt pieces still assembled inside the tail boom were the most heavily corroded. The bolt piece still assembled inside the remaining attached bottom starboard (right) side flange was removed for examination. That piece and the pieces submitted loose were examined using a 5X to 50X digital-zoom microscope. All of the pieces had fracture surfaces that were relatively flat, with some directional smearing. The bottom starboard (right) side bolt piece was cleaned using Evapo-Rust (Harris International Laboratories, Inc., Springdale, Arkansas). The cleaned bottom starboard (right) side bolt piece was examined using a Zeiss Auriga 40 field emission (FE) scanning electron microscope (SEM). The fracture surface features were consistent with microvoid coalescence. The microvoids were elongated and aligned in one direction. The fracture surface features were consistent with shear overstress. No additional work was performed on the bolt pieces. Light fret damage was observed on the mating surfaces of the tail rotor gearbox flanges and the tailboom. Most of the fret damage was obscured by secondary contact damage and corrosion that occurred after the assembly separated. There was extensive deformation to both tail rotor blades, and the tips of both had separated. The deformation, fracture path, and fracture surface features on the tail rotor blade skins were consistent with overstress. Red marks on the surfaces of the tail rotor blades near the separations were observed. The red marks were likely paint transfer from an object struck by the tail rotor blades while they were rotating, which resulted in the deformation and subsequent separation of the tail rotor blades. A Robinson Helicopter Company Service Bulletin applicable to the R44 model helicopter, SB-83 (issued May 30, 2012), references an on-going issue with tail rotor blade fatigue cracks. The fatigue cracks are observed propagating from the leading edge of a tail rotor blade in the most inboard white paint stripe. No such fatigue cracks were observed in the tail rotor blades that were examined. The tail rotor gearbox and the tail rotor blades were examined under black light. A few very small spots were observed on the leading edges of the tail rotor blades fluoresced under the black light. The spots were consistent with insect debris. No snarge or other evidence of bird strike was observed. Refer to the Materials Laboratory Factual Report in the public docket. The operator is based at Fort Glenn, a remote decommissioned United States military installation and airfield on Umnak Island. Fort Glenn is located about 9 miles southeast of the Mount Okmok volcano. The operator conducts cattle ranching operations and utilizes helicopters to aid in the mustering of cattle located throughout Umnak Island. Umnak Island is part of the Aleutian Islands archipelago. The tail rotor has two all metal blades and a teetering hub with a fixed coning angle. The pitch change bearings have self-lubricated liners. The teeter hinge bearings either have self-lubricated liners or are elastomeric. The tail roto blades are constructed with aluminum skins and root fittings. The long tail rotor drive shaft has no support bearings but has a lightly-loaded damper bearing. The tail gearbox contains a splash lubricated spiral bevel gear set. Failure is usually indicated by nose right yaw which cannot be corrected (or stopped for in a hover profile) by applying left pedal. The NTSB IIC asked the manufacturer on February 12, 2018, if any sort rapid pedal inputs at certain airspeeds by the pilot could result in the tail rotor blades contacting (via flapping) with the vertical stabilizer and or the tailboom. The manufacturer reported on February 19, 2018, that short of a component failure (such as a pitch link, pitch link rod end, hub bearing, etc.) even the most aggressive pedal input will not cause contact with the airframe. There must be enough clearance between the rotor blades and other parts of the structure to prevent the blades from striking any part of the structure during any operating condition. Aerial mustering, by definition, involves low level flying. Its hazards include vulnerability to wind shear, bank-angle illusions in crosswinds near the ground, and the inherent danger of being only a few seconds away from impact in case of an emergency or pilot distraction. The aerial mustering sector constitutes a group of individuals and organizations holding permissions to conduct aerial mustering operations for locating and concentrating stock in specific areas using a similar make and type of helicopter. Aerial mustering using a helicopter is predominantly a task specific and role related operation. The task entails locating and aggregating livestock in specific areas and driving them by means of aerial maneuvering to specific areas. Mustering operations are conducted below 500 feet agl. The aerial mustering sector is hazard rich due to the inherent characteristics of the operation, such as very low level flying, high workload, negative effects from weather, obstacles such as power lines, trees, and terrain, pilot distraction, small power margins, and extended time operating within the shaded area of the height/velocity diagram ("deadman's curve"). The Flight Safety Foundation has produced Basic Aviation Risk Standard Aerial Mustering (2016). This document provides recommended helicopter equipment and pilot equipment to be used during aerial mustering operations. This document recommends that helicopters have bladder-type fuel tanks, upper torso seat restraints, a first aid kit, an environmental survival kit, and a 406 MHz ELT. This document also recommends that pilots wear flight helmets, wear non-synthetic long pants and a long-sleeved shirt (or a fire-retardant flight suit) with cotton undergarments, wear robust enclosed footwear, and carry a satellite telephone.